Modern experienced a relative lull in new blood a little after Dominaria‘s release. But the format appears to be bouncing back, as the last couple weeks have yielded some great decklists. In this article, we’ll take a look at some of the more intriguing candidates. Brews often pop up in the 5-0 decklists Wizards publishes from their Magic Online leagues, and things are no different this time around. Chaughey’s success with Temur Delver appears to be no fluke: this marks his second consecutive finish with the deck, which has changed very little between events. While the man himself has graced us with a detailed writeup elsewhere on the internet, I’ll do my best to summarize his thoughts here for those less invested in the archetype. Vapor Snag always does what it’s supposed to do, and is brutally efficient at clearing out blockers. Forked Bolt‘s ability to gun down multiple creatures trumps the card type from Tarfire. Young Pyromancer is a worse, but crucial, additional threat in the Boltfield that is Modern. So is Snapcaster Mage, Chaughey’s least-favorite card here thanks to its high mana cost. Snap may soon become another Pyromancer, which itself is a placeholder for a better, as-of-yet unprinted creature. Faithless Looting cycles through extra threats in the removal-light matchups, as well as just provides a huge chunk of velocity across the board. Chaughey wasn’t impressed with Modern’s other cantrips. As for the sideboard, the Spheres and Feeds are concessions to Tron and Burn’s respective popularity online. On to my take: I feel that Faithless Looting essentially replaces Disrupting Shoal in this deck as a way to take advantage of card advantage not mattering so much in Modern. Looting is less narrow than Shoal, and far better when playing from behind; I like the switch in this metagame, which is chock-full of random mana costs (Krark-Clan Ironworks; Hollow One; Bedlam Reveler; Lingering Souls; etc.). Looting also allows for decisions like maxing out on Vapor Snag, a dead card in some matchups, which greatly improve our percentage against the troublesome creature decks. This idea translates to the counter suite, where Spell Pierce reigns supreme. With only 4 Delver as one-drop creatures, though, I wonder if the deck can consistently apply enough early pressure to maximize Spell Pierce, as Counter-Cat does. I also feel Wild Nacatl answers Chaughey’s expressed need for additional threats, and am looking forward to the pilot’s thoughts on Temur over that deck. A novel take on WR Prison, Nicksnack’s WR Planeswalkers focuses more intently on the deck’s planeswalker aspect. Chalice of the Void is notably absent from the deck, despite the continued omission of one-drops. Big additions here include Cast Out, a flexible removal option; Urza’s Ruinous Blast, a one-sided exiling Oblivion Stone; and Glorious End, the deck’s most intriguing card. 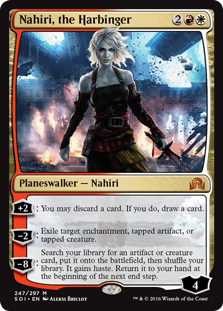 End’s clearest use is with Nahiri, the Harbinger, where it gives pilots a surprise extra turn to cheat out Emrakul and win the game. But I suppose an extra draw and attack with Gideon can also seal the deal. Lightning Bolt and Path to Exile are simple-brilliant solutions to creature decks, but I do wonder why Bolt doesn’t make the mainboard cut over some number of damage-based sweepers rather than the other way around. Path is easier to explain: Blood Moon. Murmurs of a more counters-based Affinity deck made their rounds when BG Snake was a driving force in Standard. But this recent take drops Winding Constrictor altogether, preferring more functional Arcbound Workers and the thematic Throne of Geth, which in this build is practically an unkillable Steel Overseer. Evolutionary Leap is also showing up in this deck as a way to dig into the deck’s more powerful enablers. Sacrificing a modular creature is relatively free damage-wise. I’m excited to see how this deck evolves. A couple interesting lists also came out of latest Modern Challenge. This deck feels more like a joke than anything else, but 5-0’s a real result, and there’s some savvy deckbuilding to admire here. The baby white splash for sideboard hosers is my favorite. As someone who’s always wanted to play Serum Visions in a Thought-Knot Seer deck, I hope Cryptic Command Eldrazi is more than just a fluke. Right away, I like Eldrazi Skyspawner‘s adoption as a threat that attacks from different dimensions than the beefy lone bodies of Seer and Smasher. But that’s about as much as I can manage to understand about this deck. Can it consistently assemble Cryptic Command mana with both Scavenger Grounds and Eldrazi Temple in the deck? Is Tron into Karn not a superior late-game plan? Does Unsubstantiate do something, let alone anything? If you have any insights, please share them with me in the comments. Last but not least, here’s an old Legacy favorite making its official debut in Modern. Goblin Stompy rushes out lock pieces with ritual effects and then closes out the game with Goblins. Also making its Modern debut is Standard scourge Goblin Chainwhirler, which shines at dealing with enemy creatures that can slide under a Bridge, but without killing its controller’s own small creatures. Those are pumped out by Goblin Rabblemaster and even Siege-Gang Commander, a late-game bomb that joins Hazoret in providing repeated reach under Bridge. Ensnaring Bridge is the cleverest lock piece here. While usually featured in decks that don’t attack opponents at all, Bridge is right at home in a deck looking to turn 1/1 tokens sideways; adding a second card to the hand even lets Rabblemaster attack and then grow. Chalice and Moon are givens, and eight rituals help power them all out. Dangerous Wager fills the Looting gap I once tried to solve with Cathartic Reunion in a Chalice-featuring Blood Moon deck. A potential plus, Wager is still likely to discard a card or two; discarding those cards doesn’t matter so much, though, when they were functionally dead anyway, as with redundant lock pieces. I wonder if this deck will try to adopt Sarkhan, Fireblood. I’ve been loving the card in GRx Moon, where it admittedly also fills the ‘yard for Tarmogoyf; still, there are plenty of great discards in this build, including the rituals that power out those redundant lock pieces in the first place. Any sweet brews I missed? How about details on the above decks? Drop me a line. If there’s one thing I love close to as much as this dynamic jewel of a format, it’s dissecting the very brews that make it tick! Jordan interested in seeing Bridge pop up here too. Mardu pyromancer has been maining the card. As this is normally a very easy match up for Colourless Eldrazi Stompy, but Bridge is an immediate game over, and there aren’t any answer without radically changing the deck (ratchet bomb is woeful), does this indicate a hostile meta shift that makes the deck a bad choice for the PPTQ season? I would try a fourth Bomb in the side. I’m more careful with them in the matchup now since we need them for Bridge. Chalice is maybe worth bringing back in to turn off Looting which finds more copies. I would like to have your advice for an open meta like MTGO and what do you think about the split of Reshaper/Endless One. While Relic is strong, i think that 6 pieces of grave hate are enough, and i would like to jam a Damping Matrix for some matchup like Company. 10 Spot removals are for the rise of infect and Humans. Can i have some tips? Thank you very much! Endless is better against linear combo decks; Reshaper, against removal and small creatures. Relic is also a functional draw engine against attrition/control/midrange and our best SB cards. It also helps against value-based/KotR Company decks, which are the only Company decks that can give us trouble. These and many other aspects of the deck are well-documented on this very website, so click around and happy reading. Good luck! I red them all and i finished 30 matches online with a 21-9 record. Card advantage does not matter with this deck, as you said. I won against UW Control with 4 cards in hand. May i ask you the bad matchups overall of the deck? I imagined Kotr decks and Scapeshift, but idk the others. If you read them all, surely you know 🙂 Lately I have been struggling vs. Bridge + Needle, AKA Whir decks. KotR not so bad with 2 Copter to soar over and find the Relics. Valakut still raceable without Breach. My stance on Cavern is that it’s a crutch. You should not be losing counterspell matchups to their counterspells. Our other lands are far more valuable. Get in the reps and permission will never beat you.